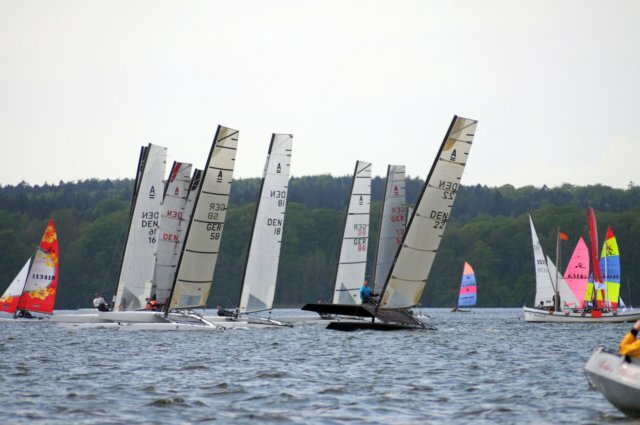 Report by Thomas Paasch -- There’ll be some big races coming up next weekend, with the Danish Nationals up north and the German/Swiss/Austrian nationals in the middle of Europe. The “A-Cat Treff” at Bosau in North Germany was the last chance to test the form for Danish and North German sailors. Hobie Cat Tiger/Wild Cat, 16, 14 and Dragoons where also invited to the regatta, so lots of different classes racing in the same race area. 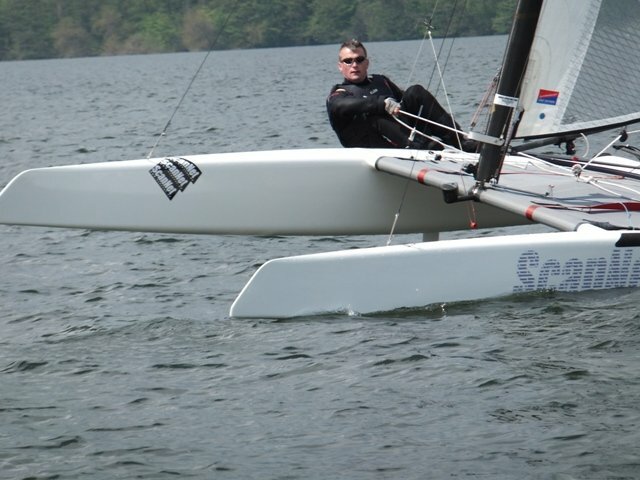 The lake of Plön is well known for it’s shifty conditions, and this time was no different. Thilo Keller was as usual strong on the downwind when the breeze was up, clean handling and good choices gave him a win in the first race. 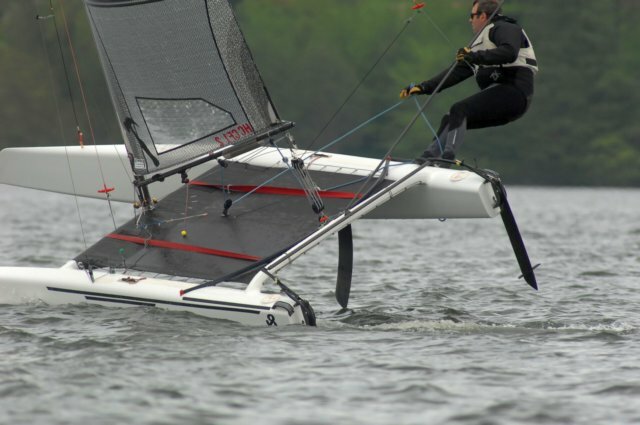 While waiting for the next race, an A-Class was taken out by a Dragoon, T-boning it right between the beams. In second race Thilo Keller and Thomas Paasch had a close battle on the last leg, constantly shifting positions while trapezing downwind, giving Thomas a win just seconds a head of Thilo. 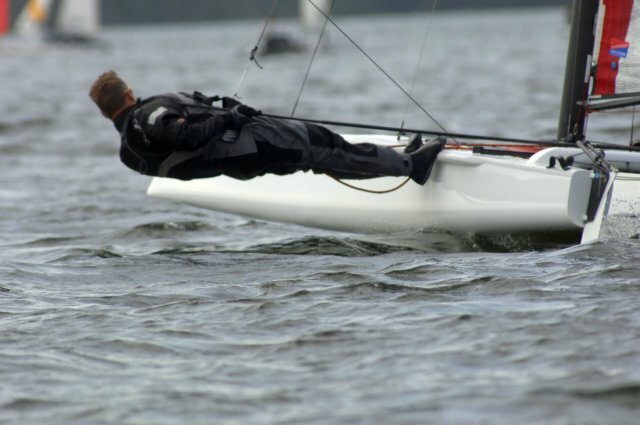 The rest of the regatta was sailed in lighter conditions, giving some of the older platforms without curved boards a chance to excel downwind. 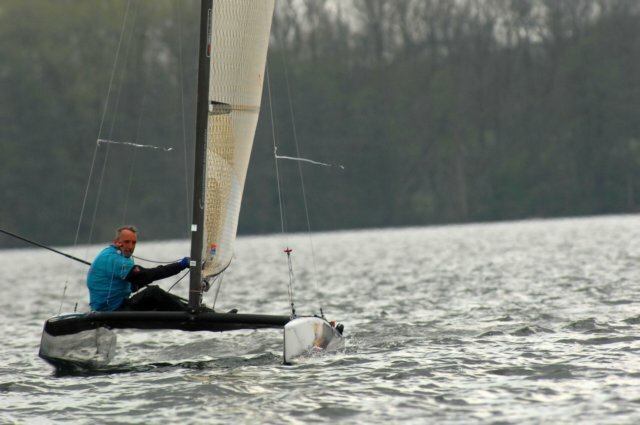 Especially Steffen Bay was fast in non-wild thing conditions in he’s Flyer mk II. A total of 6 races where sailed in mentally challenging (and for some frustrating) conditions – light and shifty.